CONGRATULATIONS to the Peace House on its 5th anniversary and celebration March 23rd, 2008. Thanks to Kay, Hadi, Johnie, Skip and all the visionaries who made it possible. The Peace House has become a second home and inspiration for activists around Texas and the world. And the Peace House was the epicenter for the resurgence in public opposition to the Iraq occupation which began in 2005. George Bush returned to the Crawford ranch on March 1, and peace activists again voiced their opposition to his illegal occupation of Iraq and twisted priorities. The visit by Bush was largely not announced thus our group was small. But we had rather speak out in small numbers against torture, than hide in a mansion ranch with hundreds and try to rationalize the authorization of war crimes. Further, a Canadian reporter spoke with us and a report appeared in the Canadian press. http://communities.canada.com/shareit/blogs/theelephant/archive/2008/03/02/as-texas-votes-crawford-prepares-for-its-curtain-call.aspx ( for report and image). And of course, the streak continues: the peace presence at the checkpoint has happened each time Bush hides out at the ranch. IRAQ 5th ANNIVERSARY MARCH--Austin, TX. The Austin Million Musician's March for Peace on March 15, 2008 commemorated the tragic 5th year of the U.S. occupation of Iraq. The march was a tremendous success with several thousand estimated in the crowd. The route was Capital to City Hall, with a concert and speakers at the City Hall grounds. The Crawford Texas Peace House float was rolling again this year with Kay Lucas, able driver Roger, Johnnie Wolfe, and many other friends of the House. Friends of Peace took a vehicle with 7 members who carried the FOP banner, other signs of peace, and rode on the Peace Train. Million thanks to the organizers of this great event, and to all those from the Waco area who supported the effort. The question on every one's mind: will we need to be back in 2009? PROGRESSIVE FILM SERIES: April 10, 2008. TITLE:" for the BIBLE tells me so." room, 703 N. Valley Mill's, Waco. 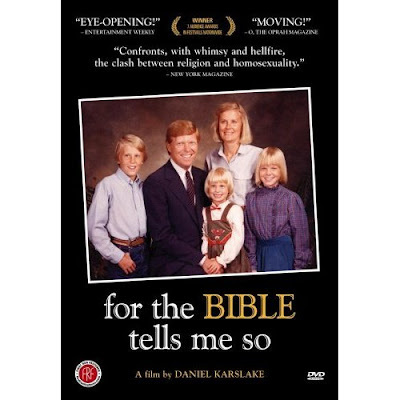 Winner of the Audience Award for Best Documentary at the Seattle International Film Festival, Dan Karslake's provocative, entertaining documentary brilliantly reconciles homosexuality and Biblical scripture, and in the process reveals that Church-sanctioned anti-gay bias is based solely upon a significant (and often malicious) misinterpretation of the Bible. As the film notes, most Christians live their lives today without feeling obliged to kill anyone who works on the Sabbath or eats shrimp. Through the experience of five very normal, very Christian , very American families - including those of former House Majority Leader Richard Gephardt and Episcopalian Bishop Gene Robinson - we discover how insightful people of faith handle the realization of having a gay child. With commentary by such respected voices as Bishop Desmond Tutu, Harvard's Peter Gomes, Orthodox Rabbi Steve Greenberg and Reverend Jimmy Creech, For The Bible Tells Me So offers healing, clarity and understanding to anyone caught in the crosshairs of scripture and sexual identity. DVD Release Date: February 2008 (Waco premiere). Recognitions: 9 Awards in festivals nationwide, incl. official selection Sundance. film series and unique forum in Central Texas. The Waco Friends of Peace staged a protest on the 5th anniversary of the Iraq occupation at the corner of Valley Mills Drive and Waco Drive from 4p.m. until 6p.m. About a dozen activists held a 15 foot banner and individual signs. The traffic was heavy during this rush hour time, and the response by motorists was about 90% positive. We were pleased with the number of protesters present during work hours, and excited by 3 or 4 new individuals who came to express the truth. A young man with imminent shipment to Iraq received counseling about his options. It was a beautiful day, and everyone there knew it was the right place to be, to express your conscience, at that moment in time. We also experienced a first on this day. ALL local TV outlets and the Herald-Tribune newspaper covered the story. So all local news reports on the 5th anniversary had voices of continued opposition to this illegal war. We reminded the people of Waco that the war has cost 1 million Iraqi lives, displaced 4.5 million Iraqis, destroyed Iraq's infrastructure and antiquities, killed 4000 Americans, injured tens of thousands, exploded the national debt, and will ultimately cost 3 trillion dollars. Thanks to all the activists who gave of their time to make an important statement. Presidential candidate John McCain held a "town hall meeting" at the HOT fair complex the evening of March 3, one day before he secured the GOP nomination for 2008. We felt strongly compelled to protest his presence: no one embodies the philosophy of constant war and imperialism more than McCain. Recently he stated that he had no problem with the U.S. occupying Iraq for 100 years. He finds bombing the people of Iran a joking matter with his vocal rendition of "bomb bomb bomb, bomb bomb Iran....." The evening was bitterly cold with a wind chill reading of about 25F. But traffic was slow and heavy and every car entering the event could definitely read our signs and banner. The messages were "McC. = WARMONGER", "vote for peacemakers not warmakers," and "7 years of Bush, haven't had enough?". Thanks to the activists above for anchoring the banner in the fierce wind: Carl, Harrison, and two high school students. It was inspiring to have the two students (Obama supporters) spontaneously join us to express their desire for a change from the policies of war and aggression. To further emphasize the message, Carl made a brief pass through the meeting carrying a sign of opposition. Although McCain may have received a warm greeting from those inside the event, all those in attendance and no doubt McCain himself realized that there are voices of conscience in Waco who reject his imperialist world view. PROGRESSIVE FILM SERIES FOR MARCH 13. TITLE: Uncounted: The new math of American elections. TIME: 6p.m. free pizza buffet. community announcements. 6:30 p.m. film and discussion. RATING: unrated. safe for all audiences. 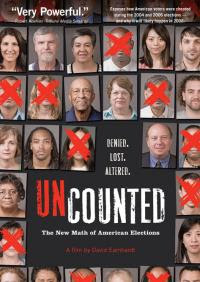 Uncounted is an explosive new documentary that shows how the election fraud that changed the outcome of the 2004 election led to even greater fraud in 2006 and now looms as an unbridled threat to the outcome of the 2008 election. The controversial film by Emmy award winning director David Earnhardt examines in factual, logical, and yet startling terms how easy it is to change election outcomes and undermine election integrity across the U.S. A very timely documentary I'm sure you will learn from and enjoy. Please come support this peace and justice forum in Central Texas. Its not who votes that counts, its who counts the votes.